Former Vice President. Nobel Peace Prize winner. Current TV chairman. Apple board member. Senior adviser to Google. 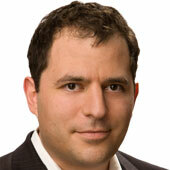 Partner at storied Silicon Valley venture capital firm Kleiner Perkins Caufield & Byers. Al Gore’s CV is as broad as they come. The latest addition to it is Generation Investment Management LLP, an asset-management outfit intended to incorporate sustainability values into the financial-services world. 10:18 am: Walt greets Gore by noting that he has just come from Steve Jobs’s memorial service. What was that like? 10:18 am: “A beautiful and moving event … It’s a terrible loss, of course, for the entire world. We’ll all miss Steve. 10:23 am: Walt: So you still expect risk-taking and game-changing? 10:23 am: Of course. Everyone on that management team could be CEO of a world-class corporation. 10:23 am: Walt: Isn’t that a problem? That people come after them? 10:24 am: Gore: Of course. But that’s not new. And I’m on the compensation committee, and we pay real close attention to that. 10:24 am: Walt: You’re also a Google adviser, and those two companies are competing. How do you handle that? 10:24 am: Gore: After Eric Schmidt left the Apple board because of conflicts, I pulled back as well. I still talk to Larry and Sergey, but never about anything where there’s competition. It’s not really a problem, but “I don’t have as many conversations with them now. And I miss that.” I’ve known them since they were 27 years old. By the way, I think Larry is doing a great job since he became CEO. 10:28 am: Gore: That depends on choices we make. “I think our political system is now badly broken.” We’ve been able to use the political equivalent of massively parallel processing to make great decisions over the past 200 years. Let me digress for a minute: The U.S. formed its superior decision-making in the wake of Gutenberg and the evolution of the print press. Allowed “the rule of reason” to let citizens and their reps make good decisions. Then, 60 years ago, TV surpassed print. And unlike the public square of print, the TV public square is controlled by gatekeepers, and access to that square requires a lot of money. So now we’ve seen a huge degradation of the conversation. 10:31 am: Walt: Hasn’t the Web fixed that? So that’s why so much political money goes into TV, and that helps explain why the system is so broken. 10:35 am: And we’re back. Gore is talking about companies who can take advantage of the innovator’s dilemma, Metcalfe’s law, etc. Gore: 5.6 billion of the world’s seven billion people have mobile phones. Less than one billion are smartphones. “But that is going to change dramatically” … “Moore’s law makes it inevitable that the low-end phones are going to get smart.” And as those 5.6 billion get smarter and smarter phones — remind me to mention the climate crisis, by the way — that’s going to unleash amazing creativity. 10:38 am: Walt: Okay, let’s talk about the climate. This ties into tech: We love all these devices. Walt gestures to writers sitting in the front row, and Gore notes “All Apple — almost all Apple.” But it seems like people in the developed world have all these great devices, but people in the rest of the world deal with the pollution. Here in Hong Kong, there’s a lot of smog, and I’m told that much of it comes from over the border in mainland China, where much of this stuff is made. Gore: About two percent of global warming comes from this stuff. “It’s a nontrivial factor.” But the good news is that the IT sector has been really good about addressing this stuff, much more so than other industries. And the other good news is that the information revolution that comes from this tech makes it easier to combat this, as well. Except for this massive disinformation campaign — reminiscent of the tobacco industry in the 1950s telling us that smoking didn’t cause cancer — that tells us this stuff isn’t a problem. One hundred million people died unnecessarily because of this, because of smoking. In this case, the largest carbon polluters — starting about 19 years ago, in the U.S., Europe and Australia and other countries — these polluters and their ideological allies “have put out a massive campaign to put out false doubts … they know that they don’t have to prove” anything, “all they have to do is put out enough false doubt.” Meanwhile, there’s nearly unanimous consensus on climate change. If you had chest pains and you consulted 100 leading doctors, and 98 of them told you to take care of your heart, that’s what you’d do. You wouldn’t pay much attention to the other two. So now you have more pollution than ever, etc. 10:46 am: Walt: But wait — isn’t a Democrat in the White House? Isn’t that your party? 10:46 am: Walt: What do you tell Obama? Gore: I give him advice, and most of the problem is in the Senate, which is totally broken. But the White House has pulled back from environmental reform, and that’s disappointing. 10:49 am: Walt: And this is all because of pollution? [Long explanation of how massive downpours are a result of pollution] “It will get a lot worse. Until we take action. Even after we take action, it will be a problem.” And the same factors creating all this rain are also creating droughts. Double, triple whammy. Q: Back to the print-TV-Web conversation. Please keep talking about the evolution of TV, in connection with your involvement with Current TV. Gore: We’ve done creative stuff at Current TV with Twitter. It’s one of a series of experiments. Last year, we had a drama series with the Sims’s Will Wright, where he had an online story-creation engine online, where people could have input on story line. Many other examples. But when you look at the opposite direction — TV on the Internet — you run into a broadband capacity problem. In the 1970s, there was only ARPANET, and twisted copper pairs. And we wanted to increase capacity via the information superhighway. But now, with video, the number of digits in a 30-minute video “is like a year’s worth of email.” And even with compression, etc., “there is a crunch coming” and “that is what has impeded the migration of TV proper onto the Internet.” For the majority of people, in the majority of the world, it is still going to be a while before we get full TV on the Internet. Q: Back to the environment. What’s actually feasible for policymakers to do? 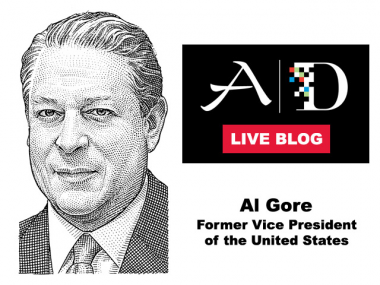 Gore: With individuals, start by “winning the conversation” — like the civil rights movement in the ’60s. Don’t put up with pollution. Then we can make changes on the consumer side. For politics: Number one, we can start putting a price on carbon. Right now we tell people it’s okay to use the global commons as a sewer. It’s not. The market is telling polluters it’s okay to pollute, so of course they will. A carbon tax and cap are important. Number two: Governments should create a green bank of development for renewables. Moore’s law is not a law of physics. It’s a law of investment. Chip power grows fast now because investors invest in R&D to make it grow fast. Same thing can be true for green R&D like photovoltaic electricity. Gore: First of all, the way the executive team at Apple are chosen is not all that different from a lot of other places — they proved themselves in other positions and worked their way up. Q: Please talk about impact of tech on the news business. Gore: I used to be a journalist for the Army. I’ve watched the evolution of the business. The most important part of the problem you’re getting at is that with the transition to Internet journalism you don’t get enough critical mass to throw off enough revenue to create good investigative journalism. Crowdsourcing helps, but that’s not a substitute for real investigative journalists who can make a decent living doing what they do best. Walt: You don’t have the model for a new journalism, right? You just want there to be a new one? Gore: Current TV has won a lot of awards. Those guys do a great job. And “60 Minutes” is great. But, increasingly, shows that used to do news are moving into infotainment. I turn on the morning news and a program that used to do news is doing a segment about a kid who’s hiccuping. But I do have to confess it’s pretty interesting. Q: What should Google do in China? Q: Advice for Obama going into 2012? Gore: I’ve given it privately. Q: What about the T-Mobile-AT&T merger. What do you think? A: My guess is that Justice so rarely takes a move like they made — “I think it’s going to be hard to overturn that decision.” They’ll fight it, but they should think about other plans. Q: Question about the failing of American education. A: I’ve tried hard! I have an “our choice” app about environmental education. I had a documentary on TV, etc. But we have a major party embracing the rejection of science, even while the majority of American people believe in the science. Q: Can you talk about financial reform in the U.S.? Gore: I think financial reform and political reform are connected. “Money plays such an unhealthy role” in U.S. democracy — “way more than in the past”. There are four anticlimate activists for every member of the Senate. “We need to move toward sustainable capitalism. Capitalism is the best system for organizing economic activity … but we have to pay careful attention to how those incentives are structured, and what they are applied to. We have to measure the full system of value.” And not just discard things that are difficult to measure — externalities. “So if we’re committed to capitalism, as I am, we have to make it sustainable.” Price tag can’t be the only marker of value. Gore: The last century and a half is an exception to the longer history, in which Asia has been the dominant force in the world. China is becoming more competitive, “and I wish them well.” But I also remember when the Soviets were going to eclipse us. Didn’t happen. Japan Inc. Didn’t happen. So, is China’s rise inevitable? I don’t know. Chinese labor costs, inflation are going way up. I’m not so sure that we can predict in a linear way what’s going to happen in the future. Ends with plug for AllThingsD. Thanks, Al!